How do you teach Numbers to 10? Do you do it all together or separate each number out, spending a week concentrating on each? We started our school year teaching the children all Numbers to 10, concentrating on subitizing and recognising numbers. However, we found that many children knew how to count to 10, could recognise and write the numbers, but when looking at collections of objects, they aways counted by 1's, not being able to recognise collections of objects. So we altered, as any teacher often has to. We spent a week investigating each number as part of Number Detectives. Every Monday we would brainstorm the letter of the week as well as the number of the week. Our brainstorm would look something like below. 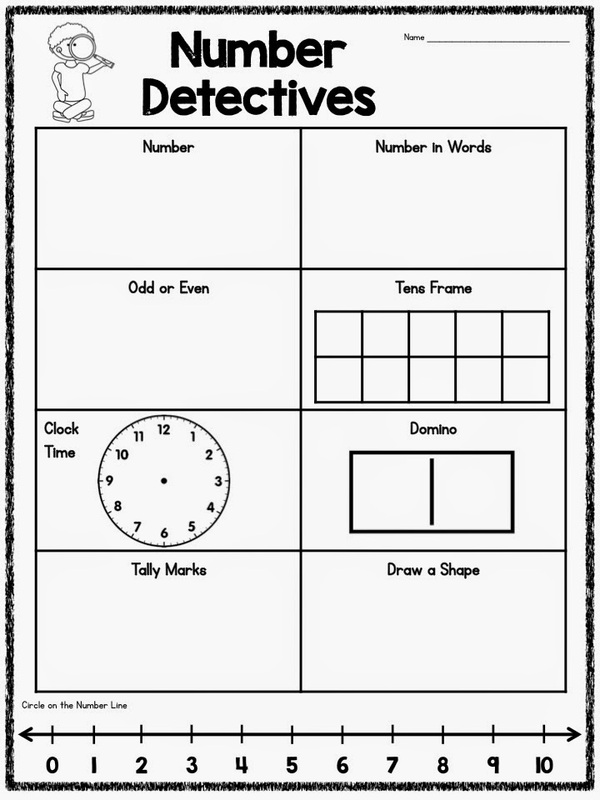 We had basic pictures and words with some incidental teaching of clock times and odds and evens. There is always a couple of kids in every class who are avid mathematicians and want to be just like their big brothers and sisters. They love the introduction of harder concepts like time. Children would also relate the number to the something in their life - like "Sam has 4 pet fish" and we would write a few of these up. 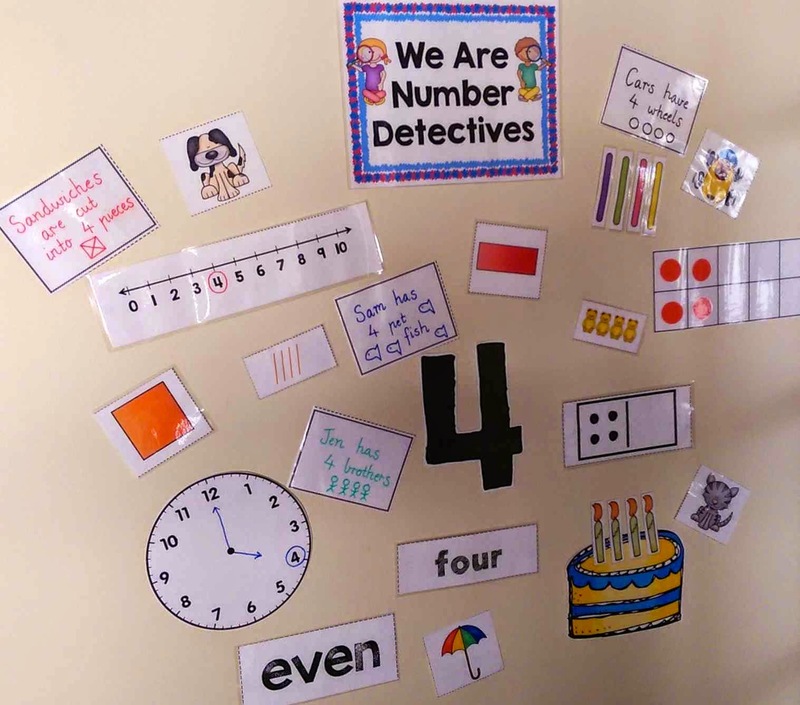 During the remainder of the week, children brought in things from home about that number, completed a Number Flip Book and Number Detectives worksheet (see below), learnt simple addition about that number, did craft activities, integrated shape and pattern into activities and learn to recognise that number straight away (subitizing). By the end of the week, they are Number experts AND through integration, we have been able to cover many of the other maths concepts they need to know in the first term! The next week, we would work on the next number and repeat the process - nothing like setting up routines in the first few weeks of school! I've put together this pack that contains everything you will need to create the brainstorm in your classroom for Numbers 1 to 10 as well as the worksheet above. 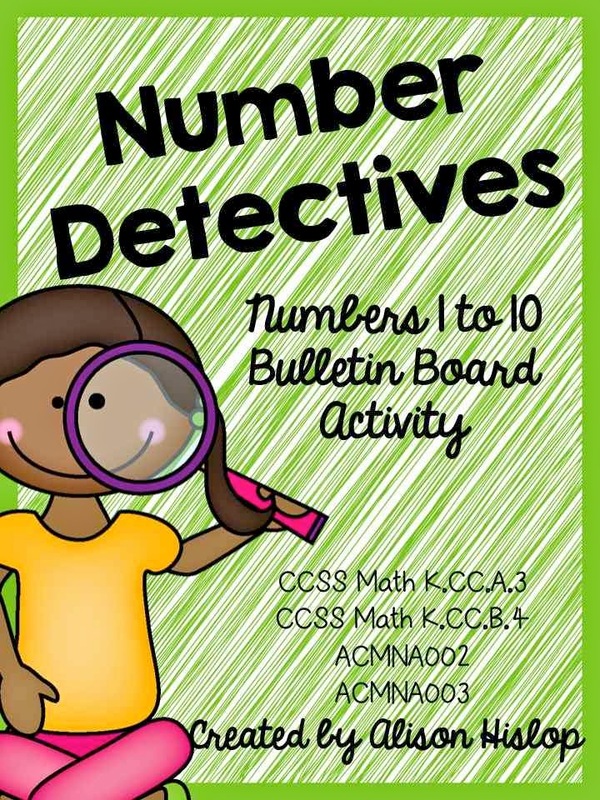 It does require a little bit of laminating, but they are resources that are used over and over again each week! Click here to download your own copy of this Bulletin Board pack. Hi Alison! I'm so glad I found your blog! It's great. I love getting new math ideas!